Home Opinion Conspiracy Theory or Reality? It is understood that some Americans are waiting for indictments to start soon. No, not the ones that the new House members-elect are planning for President Trump. All things get exposed in the end. Good people speak out and tell the truth. Dan Bongino is not a household name yet. Watch and learn what he has to say in the video that will follow a brief description of who he is. “Bongino worked with the New York City Police Department for four years, from 1995 to 1999. He joined the U.S. Secret Service in 1999 as a special agent leaving the New York Field Office in 2002 to become an instructor at the Secret Service Training Academy in Beltsville, Maryland. In 2006, he was assigned to the U.S. Presidential Protection Division during George W. Bush’s term. He remained on protective duty after Barack Obama became President, leaving in May 2011 to run for the U.S. Senate. 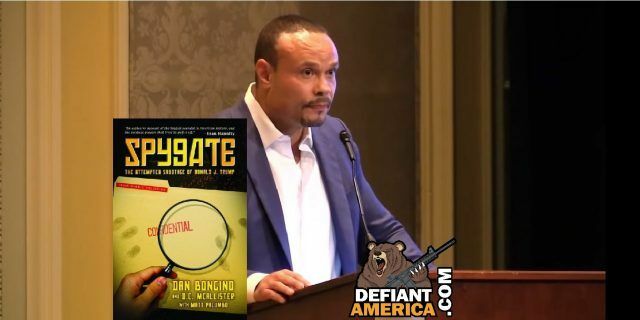 In late 2013, Bongino’s book about his career as a secret service agent, Life Inside the Bubble, was released and immediately made it onto both the New York Times and Amazon Best Sellers list. The book discusses his experiences protecting presidents George W. Bush and Barack Obama and investigating federal crimes along with his 2012 run for the U.S. Senate in Maryland. Bongino defended President Obama in terms of the Birther allegations. He has a new book out, “SPYGATE”, that will knock your socks off. He reveals the SWAMP in all the murky connections key political figures have with each other. So, now we know that eventually, and I hope sooner than later, political figures will face indictment. Believe it or not, the deception that the Democrats have pulled off, gets worse. The Democrats have been trying to get nuclear fuel to Iran for a long time. It was made public by the President of Argentina, Cristina Fernández, in her speech to the UN General Assembly. Fernández accused Gary Samore (USA) of asking Argentina to provide Nuclear Fuel to Iran in 2010. From 1996 to 2000, Samore served as Special Assistant to President Bill Clinton and Senior Director for Nonproliferation and Export Controls at the National Security Council. Samore is an Advisory Board member of the advocacy group United Against Nuclear Iran. He served as president of organization from September 2013 to August 2015. He is also an Advisory Board member of the Counter Extremism Project. Put all the information together and what you have is almost too impossible to believe. Russia-Iran deals that started, which American Presidents instigated? The current Russian Probe that really is a “witch hunt”? The dirty tactics that the Democrats have used will blow up in their faces. Is what I’m showing you a conspiracy theory or is it reality? You judge for yourselves. Hey, this article is much more interesting than watching George H. Bush’s life and the long drawn out funeral that will follow. President Trump does have a “Trump Card” and it is waiting to be pulled out and used. Next articleDid Trump Make another Deal?